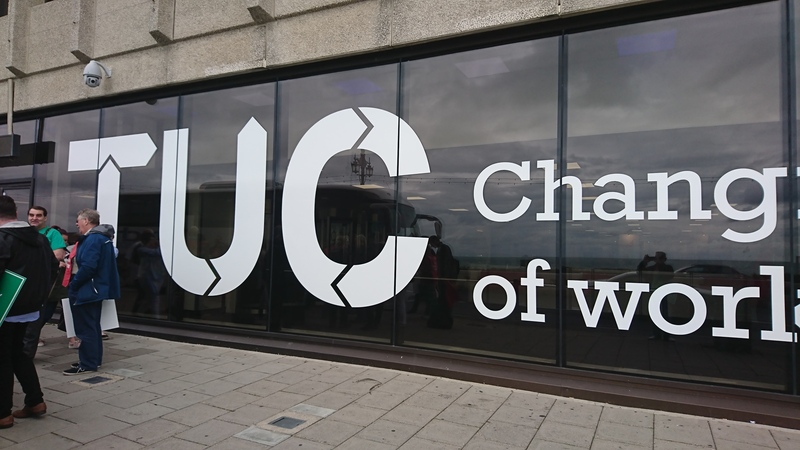 From there, we engaged with a number of trade unionists attending the conference and were met with a very good reception for the message. 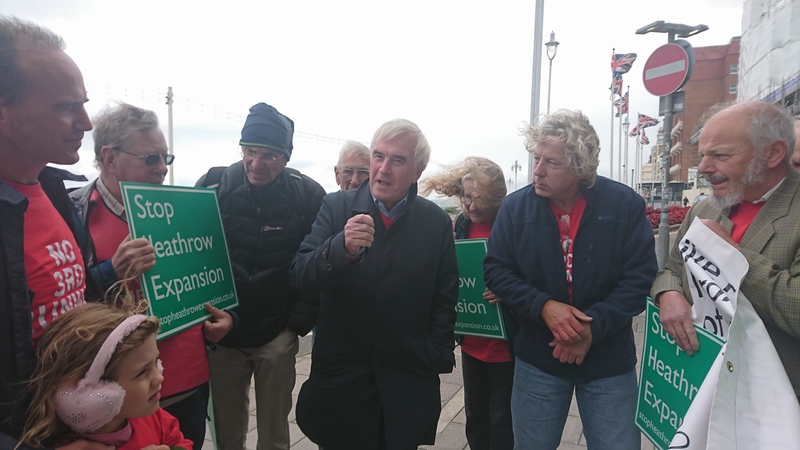 I had a long chat with a gentleman who was handing out copies of Unity and was a member of UNITE – he was in agreement with us and was surprised that his Union leader, Len McCluskey, was in favour of Heathrow Expansion. Hopefully, the UNITE members we spoke with today who agreed with us will pass the message on and get him to change his mind! After the initial mass pictures, the team split up with some remaining to speak further with delegates entering whilst others of us went for refreshments before rejoining the fray outside the conference building. 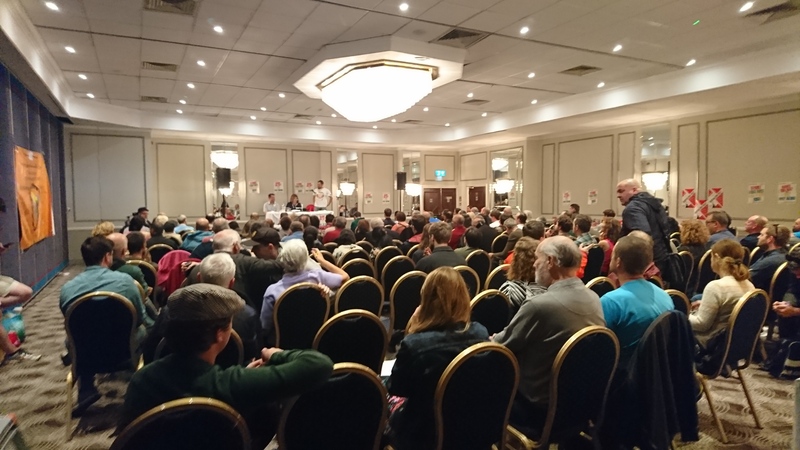 Amongst leaflets being handed out were some advertising a national shop stewards network event at the nearby Holiday Inn where UNITE General Secretary, the aforementioned Len McCluskey, was due to speak. I suggested to SHE stalwart Neil Keveren that it might be an idea for me to pop down to the venue for ten minutes before our coach arrived for the return journey and try to get a word with him. He agreed and I trotted off with a placard and my No 3rd runway T-shirt to see if I could get an audience with arguably the most powerful Union leader in the UK. 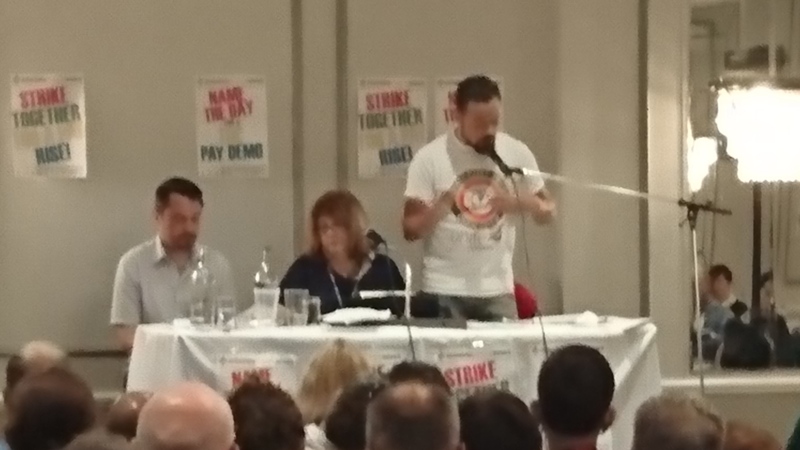 Unfortunately, Mr McCluskey was nowhere to be seen but I arrived just as a Unite shop steward for the British Airways cabin crew took to the stage. I dropped my fleece to reveal my red SHE t-shirt and held the green SHE placard above my head at the back of the hall – this was not unnoticed by the speaker, no doubt I won’t get served any in flight refreshments if I choose to fly BA in the near future! To be fair, the story he recounted of the pay and conditions of the cabin crew on differing contracts was compelling and not to the credit of ‘The World’s Favourite Airline’. With BA Chief Executive Willie Walsh complaining that a third runway would raise his operating costs, I wonder if he realises how his members pay could be affected should the project go ahead? 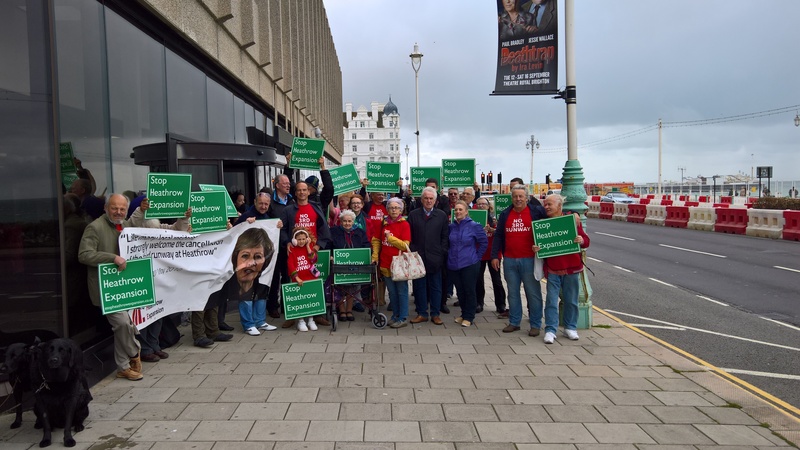 After an uncomfortable exit from the hotel where I was recognised as a former UKIP candidate, a brisk walk along the front brought me back to the rest of the group just as the coach was turning up for the return journey. 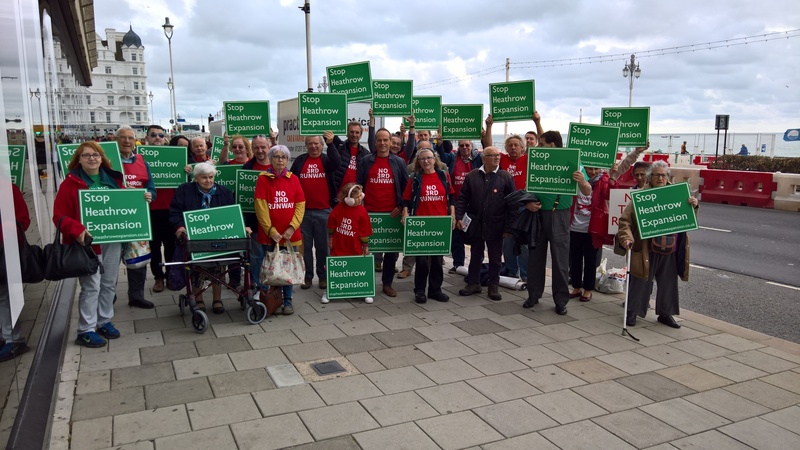 The general feeling was that we had received a favourable reception and hopefully this will filter through to those trade union bosses who think that a third runway is a good idea. Heathrow won’t pay the full cost of a third runway. For a start, it won’t pay the £17bn needed for transport infrastructure to support this massive expansion. This largely foreign owned company wants the UK taxpayer to front the bill and it is using the lure of jobs to get approval.Don’t expect to get what you are promised. Outlandish predictions of 180,000 UK jobs are based on £147bn economic benefits, suggested by The Airports Commission.However, even the DfT have scaled back the maximum economic benefit to £6.1bn over 60 years! Not quite the golden jobs forecasts we were led to believe by Heathrow. Despite the reduced benefit, the same jobs projection figure is being claimed. As well as this being completely fanciful, most of those people will never be held accountable when the jobs don’t happen. Heathrow will promise anything to get expansion. When it wanted Terminal 5 it made a range of promises on jobs – none were kept. In 1993 The Airports Policy Consortium said 9000 would be saved. In 1999, the figure from John Egan, BAA Chief exec, was 16,000 local jobs. In November 2001, it claimed T5 would create 6500 jobs at the airport. Yet Heathrow have failed at every opportunity to reveal the increase in jobs since T5 opened. Offering jobs is a way to persuade people in poorer regions to support taxpayers money being invested in the South East yet again. Projects to electrify Northern railways or provide UK wide broadband coverage suffer while money is allocated for more development at Heathrow. Heathrow must spend around £17bn for its third runway and it has recently asked the CAA to allow it to raise charges for passengers to cover the risk of extra costs. An overrun in Heathrow’s costs of just 1% would be enough to negate the overall benefits of the scheme. We all want our children to make the most of their education and have a satisfying career. The towns where residents live close to the northern runway and might expect to benefit from airport jobs has the highest percentage of workers in elementary jobs in the London Borough of Hillingdon and the lowest percentage of professionals according to the 2011 census. 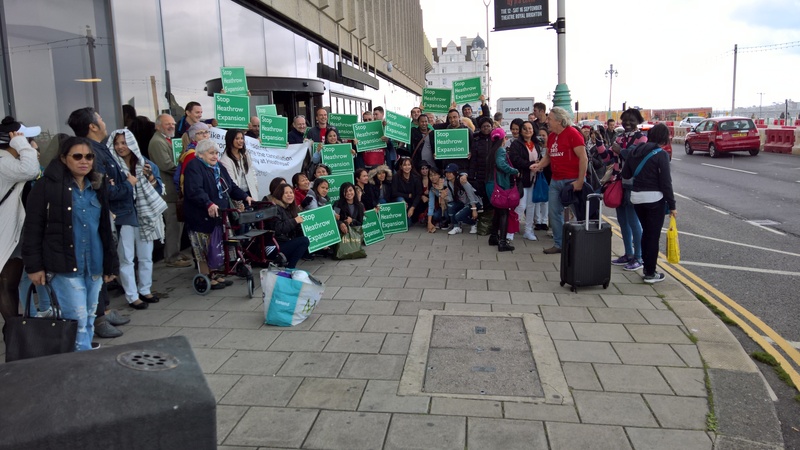 ‘Poverty Pay’ was the reason Unite gave for strike action by British Airways Mixed Fleet Cabin Crew. The union could find no evidence that crew achieved anything like the advertised ‘£21,000-£25,000’ for the job. The reality was a base starting at £12.000 with £3 an hour flying pay. 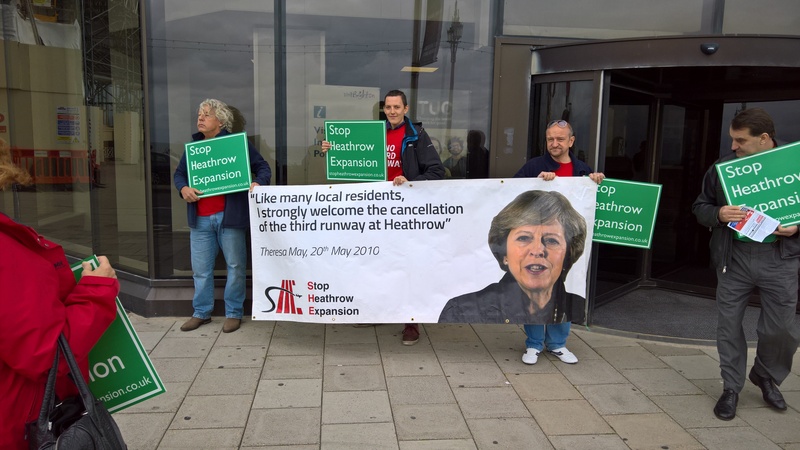 This entry was posted in Heathrow Third Runway, The Economy and tagged Heathrow Expansion, John McDonnell MP, Len McCluskey, Stop Heathrow Expansion, Third Runway, TUC, UNITE.